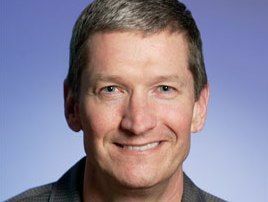 Apple CEO Tim Cook took to the stage at the Goldman Sachs Technology and Internet Conference last night to deliver the keynote speech. During the speech he covered topics from Apple factory working conditions, to how he intends to run the company in the absence of late CEO Steve Jobs. When asked what he was determined to maintain now that Steve Jobs is no longer around, Cook said: "Steve grilled in all of us over many years that the company should revolve around great product, and that we should stay extremely focused on just a few things rather than try to do so many that we do nothing well. We should only go into markets where we can make a significant contribution to society, not just sell a lot of products. "And so, these things, along with keeping excellence as an expectation of everything at Apple, these are the things that I focus on because I think those are the things that make Apple this magical place. We're always focused on the future. We don't sit and think about how great things were yesterday. I love that trait. I think it's the thing that drive us all forward." Responding to a question about tablets, Cook went into why Apple isn't in a hurry to start a price war with competitors, saying: "Price is rarely the most important thing. A cheap product might sell some units. Somebody gets it home and they feel great when they pay the money, but then they get it home and use it, and the joy is gone. "The joy is gone every day that they use it until they aren't using it anymore. You don't keep remembering 'I got a good deal!' because you hate it!" Working conditions at factories manufacturing Apple products has been a hot news topic recently, and Cook gave a statement about the company line during his speech. Addressing a question on the issue, he said: "Apple takes working conditions very, very seriously, and we have for a very long time… Our commitment is simple: Every worker has the right to a fair and safe work environment, free of discrimination, where they can earn competitive wages and they can voice their concerns freely. "Apple suppliers must live up to this to do business with Apple. If we find a supplier that intentionally hires underage labour, it's a firing offense." This tallies with Tim Cook's recent email to Apple staff assuring them that he was taking the matter in hand and his invitation to the Fair Labor Association to inspect working conditions for itself.